According to the Centers for Disease Control and Prevention, about 1.7 million people will contract an infection while in the hospital or another health care facility. Around 90,000 of these people will die. But even those who survive can suffer terribly, being forced to miss work and incurring additional medical expenses to treat their illness. If you pick up an infection while in the hospital, you might be entitled to financial compensation. Please contact one of our Daytona Beach medical malpractice attorneys right away. Staphylococcus aureus. This bacterium is found in the skin of most people and is usually harmless. However, if the bacteria enter deeper into the body, then a staph infection can become deadly. There are many influenza viruses which can spread in a hospital setting. This illness is caused by a particular bacterium, Mycobacterium tuberculosis, which can travel through the air. coli. This bacterium is found in most people’s intestines, but it can cause severe food poisoning. Some of these bacteria are even resistant to certain antibiotics. For example, some staph bacteria are resistant to methicillin. About 2 million people every year contract a bacterial infection that is resistant to antibiotics, and over 20,000 of them will die. For treatment, you might need to try different antibiotics to find one that is effective, and you could end up having to stay in the hospital much longer than expected. Is the Hospital to Blame? If you pick up an infection within 48 hours of being admitted to the hospital, then you have a hospital-associated infection. Hospitals take infections very seriously and have extensive protocols in place to keep staff from transmitting these microbes from patient to patient. If the hospital is to blame, then they have been negligent, and you might be able to bring a lawsuit against them. The key will be to determine what the hospital knew and when it knew it. For example, if the hospital knows an infection is circulating when you catch it, then you have a much stronger case. The hospital is on notice that it needs to be especially careful to prevent any spreading. 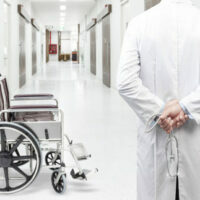 At Bundza & Rodriguez, our Daytona Beach medical malpractice attorneys have built their reputations holding doctors and hospitals accountable when their negligence injures patients. We are skilled at bringing these cases and know how to obtain a favorable settlement to cover your losses. Please contact us today by calling 386-252-5170. We offer a free consultation to potential clients.